The Capitals' faithful filed the Verizon Center to watch their team play the Toronto Maple Leafs. They were not disappointed in the effort the home team gave. In one of the loudest home openers in memory, the Caps dominated the Leafs through at least two periods and hang on to finish with a 6-4 win. Alex Semin played one of the best games I have seen him play as a Capital. He scored a pair of goals and he had an assist. He also played a bit more physical throwing a hit and not shying away from the Leafs defense. Other Caps adding to the scoresheet were Alex Ovechkin, Brooks Laich and new comers Brendan Morrison and Mike Knuble. "It felt like we were in a piranha fish tank," Leafs head coach Ron Wilson said of the Capitals quick start. "They came out and they were all fired up." Even though the Caps were out shot through most of the game they were dominating the play against the Leafs through the first two periods. They held a comfortable lead going into the third period 6-1. But the hard-work Leafs didn't quit and the Caps were guilty of letting up a little. "It’s a great start but we have to learn to win 6-1 and not think we are going to win 9-1," Bruce Boudreau said. "It was a cheap lesson for us." "We can’t turn the puck over against them, because they are coming two guys hard," Caps' defenseman Shaone Morrisonn added. "It’s a team that works very hard. We don’t want to be giving up that many goals. When we are up 6-1, going into the third we want to finish the game." The Leafs were able to shut down the Caps' dynamic scoring and score three straight goals in third period. A stark contrast from the stingy defense played up in Boston where the Caps held their foes to only 3 shots in the final frame. "In the third period we came out determined not to let any more goals in, played a little bit better defensively and found a way to get back into the game," Wilson said when asked about the positives the Leafs could take from the game. Semyon Varlamov played very well through the first two periods and then was left out to dry in the third by his collapsing defense. But when he had to make the big stop for the Caps, he was there. He did the full on splits to make a save on John Mitchell who was looking at an open net. Varly was there for a few more saves for his first win of the season. "Toronto is a team that shoots everything and on the PK, [Varlamov] had some big stops," Shaone Morrisonn said of his goaltender. "He is a young kid and he is just going to get better and better." What did work through the first two periods of the game was the Caps transition game, which turned out four or five breakaways on the Maple Leafs who let forwards get in behind them. "Our transition game is great, it’s top notch," Brendon Morrison said. "Get the puck, move it up the ice, chip and support, use our speed ... We have got guys that can skate and guys that can score so we are a dangerous team on transition." Puckhead's Player of the Game is Alex Semin who impressed me in this game. He was moving his legs, he was playing more physical and he got rewarded for taking the puck to the net. Semin also stayed around the locker room to answer questions from reporters, something he rarely did since his arrival to DC. The Hershey Bears opened their season tonight against the Norfolk Admirals and won 3-1. Andrew Gordon scored a hattrick and Braden Holtby nearly had the shut out. Keith Aucoin and Alex Giroux both had three assists on the night as well. The Caps gave out Mike Green bobble head dolls for the home opener. Green had one assist tonight and was a -1. The Caps "dropped" their '08-'09 Southeast Division Championship banner before the game. The Leafs did not attend the pregame ceremony. The Caps redid all of their banners and retired numbers to match the teams red, white and blue uniforms. The banners are also much bigger than last years. 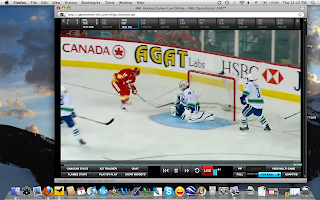 This is the third year I bought into the NHL Gamecenter Live online. 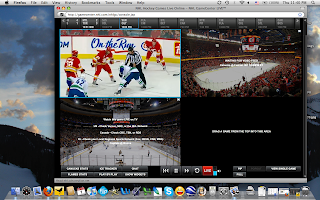 It's the NHL's online version of Center Ice where you can watch games not in your market on your computer. It has been a process with this NHL service for the last couple of years, but this time they have got it right. The viewing screen has grown to fill up a good size of your monitor and is in the HD format (when available). The picture is super clear with little or no hiccups, thus far. They have added a new DVR-like controls with a download where you can pause, rewind and replay the action. Also there is picture in picture (PIP) and real time scores to keep track of all the action. I use to cringe every time my credit card was charged for the service, but this year it has been definitely worth the price tag ($159.00 USD). Games are still blacked out if they are on local television (like Versus, NBC, NHL Network, etc.). It's not a service if you just like your local team because they black it out every time. The window will slow a bit if you open more than 2 or 3 games at once. But, if you have high speed Internet, it is not so bad. If don't have high speed Internet, it will not work as well and you should not get it. It might be worth a spin if you are a super NHL fan and love to watch out of market games from your computer and/or to keep track of your adopted Western/Eastern Conference team. Alex Ovechkin and the Washington Capitals played their season opening game against the Boston Bruins and things went just about text book. The Capitals got goal production from the power play, killed all of their penalties, got a pair of goals from Ovechkin. All in all a good road game for the Capitals as they beat last year's number one team in the East 4-1. Ovi had a great start to the season netting a pair of goals. His first goal was off of a bad line change by the Boston Bruins and Ovi was the late man in. He beat Tim Thomas with a wrister 5 hole. His second goal was off a feed from Tom Poti who had carried the puck from his own goal line. Poti just sent the puck toward a breaking Ovi in the slot who had Milan Lucic all over his stick. But he over powered Lucic and sneaked the puck past Thomas to put get the game's fourth goal. Ovechkin was one of three players who had a three point night. Brooks Laich scored a pair of goals on the power play, one off of a great set up pass by Nick Backstrom and the other when Thomas failed to cover the puck on a Backstrom shot as well getting an assist on Ovi's second goal. Backstrom himself finished with three assists. Alex Semin had a pair of assists while Poti had an assist as well. The Capitals' special teams did its job. The power play was a dangerous aspect of the Caps game as they were 2 for 4 with the extra man. The penalty kill took care of all 5 of the Bruins power plays and only allowed one Boston shot on net. But what impressed more than anything was the Capitals ability to come into a team's building on their home opener and steal a game away. The Caps were able to nullify the Bruins' aggressive forecheck with quick passes up the boards. Boston certainly could have used some more speed against their foes, maybe the missing piece was traded to Toronto. The Caps were also solid on defense. They only allowed Boston seven shots in the second period and only three shots in the third period. Only when David Steckel lost control of the puck sending Patrice Bergeron on a break away. He beat Jose Theodore with a great deke. For the most part, the Caps defense did a great job of stepping into the Bruins' shots. Those that did get through to Theo were stopped. There wasn't much need of an enforcer, but John Erskine went to fisticuffs with Shawn Thornton anyway. I was surprise that Thornton didn't get an instigator penalty after he clearly dropped the gloves before Erskine did. The Bruins did get burned after Ovechkin cleanly hit Mark Recchi and Zdeno Chara cross checked Ovi in response. The Caps didn't take long to score on the ensuing power play proving that the Caps would rather score on any retaliation penalty rather than just have a fighter out there to protect. There is not too much to complain about as the Caps first game. It was a good road game win. For all the drama of Micheal Nylander and Chris Bourque being claimed on waivers by a rival, the Caps put all the off ice problems behind them to get the win they needed against a very good defensive team in Boston. The Caps come home to face Toronto Saturday night at the Verizon Center. They will face a grittier and tougher team in the Maple Leafs who nearly won their home opener against Montreal before they fell to the Habs 4-3. Puckhead's Player of the Game is Alex Ovechkin who started off much like he left off from last season. He was also the game's number one star. He is well on his way to defending his title league's most valuable player. After years of quietly pulling for the 5'9", 173 lbs. forward to make it the big club, it finally happened and didn't happen, then happened again all at once. Calling him a dark horse to make the Capitals for almost 3 years now, it was exciting to see a spot for him in the lineup. But when the salary cap became an issue, the Caps had no choice but to put some one on waivers to send them back to Hershey. Pittsburgh picked up the crafty forward and in a way, Chris Bourque finally made a NHL roster, just not the Caps roster. Frankly, I am happy for him. He goes to a team that thinks they can use him after the Penguins themselves lost a player to the waiver wire. Bourque has his shot at the big league and maybe this is for the best in the end. He has the potential to be a sneaky scoring forward. The Penguins will be forced to play the young forward, or place him on waivers yet again if they send him to the W/B Baby Pens. We all sort of got hypnotized by the last name Bourque. But as I always say, don't hate the player, hate the game. Since I love the game, I have to accept it and know that Bourque will be just fine in a Penguins' sweater. As for the Caps, they just lose out on a player with no compensation for him. A bit frustrating to see the Caps' management got caught with their pants down a bit. And don't put this on Micheal Nylander, he didn't put Bourque on waivers or force GM George McPhee's hand to do so. McPhee signed Nylander to begin with, now McPhee has to deal with his contract the best he can since Nylander doesn't fit in Bruce Boudreau's system. Caps are all set for their season opener against Boston. Jose Theodore will likely be in net for the first game. Mike Knuble may not see any first line duties at first according to how they have lined him up on the second line in practices. Of course, this just might be Boudreau holding his hand close to his vest. Matt Bradley will be wearing a newly designed helmet to prevent concussions made by Cascade Sports and designed by Mark Messier. I have some first hand knowledge of the helmet, because I have been playing with the Cascade helmet for just over a year now. It may look a little bigger, but if it does what it says then it's worth it.